A plough (UK) or plow (US; both /ˈplaʊ/) is a tool or farm implement used in farming for initial cultivation of soil in preparation for sowing seed or planting to loosen or turn the soil. Ploughs are traditionally drawn by working animals such as horses or cattle, but in modern times may be drawn by tractors. A plough may be made of wood, iron, or steel frame with an attached blade or stick used to cut the earth. 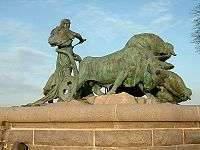 It has been a basic instrument for most of recorded history, although written references to the plough do not appear in English until c. 1100 at which point it is referenced frequently. 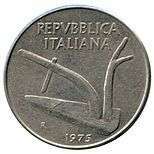 The plough represents one of the major agricultural inventions in human history. 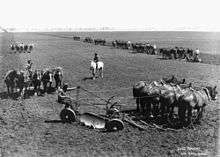 Ploughs were initially human powered, but the process became considerably more efficient once animals were pressed into service. 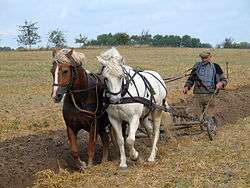 The first animal powered ploughs were undoubtedly pulled by oxen, and later in many areas by horses (generally draft horses) and mules, although various other animals have been used for this purpose. In industrialised countries, the first mechanical means of pulling a plough were steam-powered (ploughing engines or steam tractors), but these were gradually superseded by internal-combustion-powered tractors. Modern competitions take place for ploughing enthusiasts like the National Ploughing Championships in Ireland. Use of the plough has decreased in some areas, often those significantly threatened by soil damage and erosion, in favour of shallower ploughing and other less invasive conservation tillage techniques. Natural farming methods are emerging that do not involve any ploughing at all, unless an initial ploughing is necessary to break up hardpan on a new plot to be cultivated, so that the newly introduced soil life can penetrate and develop more quickly and deeply. By not ploughing, beneficial fungi and microbial life can develop that will eventually bring air into the soil, retain water and build up nutrients. A healthy soil full of active fungi and microbial life, combined with a diverse crop (making use of companion planting), suppresses weeds and pests naturally and retains rainwater. Thus the intensive use of water-, oil- and energy hungry irrigation, fertilizers and herbicides are avoided. Cultivated land becomes more fertile and productive over time, while tilled land tends to go down in productivity over time due to erosion and the removal of nutrients with every harvest. Proponents of permaculture claim that it is the only way of farming that can be maintained when fossil fuel runs out. 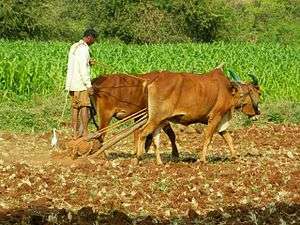 On the other hand, the advantage of agricultural methods that require repeated ploughing are that they allow monocropping on a large scale at remote locations, using industrial machinery rather than human labor. 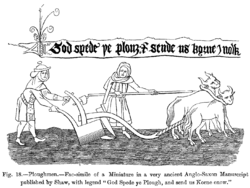 In older English, as in other Germanic languages, the plough was traditionally known by other names, e.g. Old English sulh, Old High German medela, geiza, huohilī(n), Old Norse arðr (Swedish årder), and Gothic hōha, all presumably referring to the ard (scratch plough). 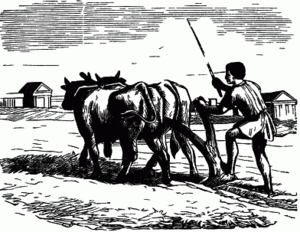 The term plough or plow, as used today, was not common until 1700. 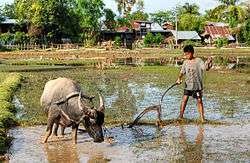 When agriculture was first developed, simple hand-held digging sticks and hoes were used in highly fertile areas, such as the banks of the Nile where the annual flood rejuvenates the soil, to create drills (furrows) to plant seeds in. Digging sticks, hoes, and mattocks were not invented in any one place, and hoe-cultivation must have been common everywhere agriculture was practiced. Hoe-farming is the traditional tillage method in tropical or sub-tropical regions, which are characterized by stony soils, steep slope gradients, predominant root crops, and coarse grains grown at wide distances apart. While hoe-agriculture is best suited to these regions, it is used in some fashion everywhere. Instead of hoeing, some cultures use pigs to trample the soil and grub the earth. 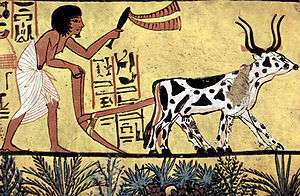 Some ancient hoes, like the Egyptian mr, were pointed and strong enough to clear rocky soil and make seed drills, which is why they are called hand-ards. However, the domestication of oxen in Mesopotamia and the Indus valley civilization, perhaps as early as the 6th millennium BC, provided mankind with the draft power necessary to develop the larger, animal-drawn true ard (or scratch plough). The earliest was the bow ard, which consists of a draft-pole (or beam) pierced by a thinner vertical pointed stick called the head (or body), with one end being the stilt (handle) and the other a share (cutting blade) that was dragged through the topsoil to cut a shallow furrow ideal for most cereal crops. The ard does not clear new land well, so hoes or mattocks must be used to pull up grass and undergrowth, and a hand-held, coulter-like ristle could be used to cut deeper furrows ahead of the share. Because the ard leaves a strip of undisturbed earth between the furrows, the fields are often cross-ploughed lengthwise and widthwise, and this tends to form squarish fields (Celtic fields). The ard is best suited to loamy or sandy soils that are naturally fertilized by annual flooding, as in the Nile Delta and Fertile Crescent, and to a lesser extent any other cereal-growing region with light or thin soil. By the late Iron Age, ards in Europe were commonly fitted with coulters. To grow crops regularly in less fertile areas, the soil must be turned to bring nutrients to the surface. 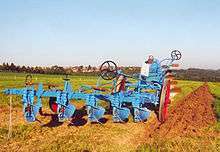 A major advance for this type of farming was the turnplough, also known as the mouldboard plough (UK), moldboard plow (US), or frame-plough. A coulter (or skeith) could be added to cut vertically into the ground just ahead of the share (in front of the frog), a wedge-shaped cutting edge at the bottom front of the mouldboard with the landside of the frame supporting the undershare (below-ground component). A runner extending from behind the share to the rear of the plough controls the direction of the plough, because it is held against the bottom land-side corner of the new furrow being formed. The holding force is the weight of the sod, as it is raised and rotated, on the curved surface of the mouldboard. Because of this runner, the mouldboard plough is harder to turn around than the scratch plough, and its introduction brought about a change in the shape of fields — from mostly square fields into longer rectangular "strips" (hence the introduction of the furlong). An advance on the basic design was the iron ploughshare, a replaceable horizontal cutting surface mounted on the tip of the share. The earliest ploughs with a detachable and replaceable share date from around 1000 BC in the Ancient Near East, and the earliest iron ploughshares from ca. 500 BC in China. Early mouldboards were basically wedges that sat inside the cut formed by the coulter, turning over the soil to the side. The ploughshare spread the cut horizontally below the surface, so when the mouldboard lifted it, a wider area of soil was turned over. Mouldboards are known in Britain from the late 6th century on. 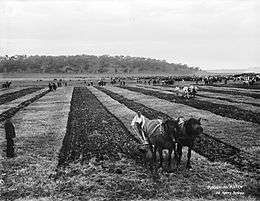 Loy ploughing was a form of manual ploughing in Ireland, on very small farms — or on very hilly ground, where horses could not work or where farmers could not afford them. It was used up until the 1960s in poorer land. This suited the moist climate of Ireland, as the trenches formed by turning in the sods providing drainage. It also allowed the growing of potatoes in bogs as well as on mountain slopes where no other cultivation could take place. In the basic mouldboard plough the depth of the cut is adjusted by lifting against the runner in the furrow, which limited the weight of the plough to what the ploughman could easily lift. This limited the construction to a small amount of wood (although metal edges were possible). These ploughs were fairly fragile, and were not suitable for breaking up the heavier soils of northern Europe. The introduction of wheels to replace the runner allowed the weight of the plough to increase, and in turn allowed the use of a much larger mouldboard faced in metal. These heavy ploughs led to greater food production and eventually a significant population increase around AD 600. Before the Han Dynasty (202 BC –AD 220), Chinese ploughs were made almost entirely of wood, except the iron blade of the ploughshare. By the Han period, the entire ploughshare was made of cast iron; these are the first known heavy mouldboard iron ploughs. The basic plough, with coulter, ploughshare and mouldboard remained in use for a millennium. Major changes in design did not become common until the Age of Enlightenment, when there was rapid progress in design. 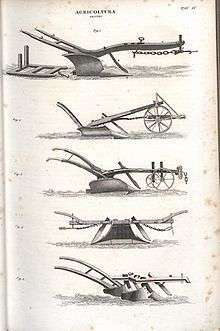 Joseph Foljambe in Rotherham, England, in 1730 used new shapes as the basis for the Rotherham plough, which also covered the mouldboard with iron. Unlike the heavy plough, the Rotherham (or Rotherham swing) plough consisted entirely of the coulter, mouldboard and handles. It was much lighter than conventional designs and became very popular in England. It may have been the first plough to be widely built in factories and the first to be commercially successful. In 1789 Robert Ransome, an iron founder in Ipswich started casting ploughshares in a disused malting at St Margaret's Ditches. As a result of a mishap in his foundry, a broken mould caused molten metal to come into contact with cold metal, making the metal surface extremely hard — chilled casting — which he advertised as "self sharpening" ploughs, and received patents for his discovery. Improvements on this followed developments in metallurgy: steel coulters and shares with softer iron mouldboards to prevent breakage, the chilled plough (an early example of surface-hardened steel), and eventually the face of the mouldboard grew strong enough to dispense with the coulter. The first mouldboard ploughs could only turn the soil over in one direction (conventionally always to the right), as dictated by the shape of the mouldboard, and so the field had to be ploughed in long strips, or lands. The plough was usually worked clockwise around each land, ploughing the long sides and being dragged across the short sides without ploughing. The length of the strip was limited by the distance oxen (or later horses) could comfortably work without a rest, and their width by the distance the plough could conveniently be dragged. These distances determined the traditional size of the strips: a furlong, (or "furrow's length", 220 yards (200 m)) by a chain (22 yards (20 m)) — an area of one acre (about 0.4 hectares); this is the origin of the acre. The one-sided action gradually moved soil from the sides to the centre line of the strip. If the strip was in the same place each year, the soil built up into a ridge, creating the ridge and furrow topography still seen in some ancient fields. The reversible plough has two mouldboard ploughs mounted back-to-back, one turning to the right, the other to the left. While one is working the land, the other is carried upside-down in the air. At the end of each row, the paired ploughs are turned over, so the other can be used. This returns along the next furrow, again working the field in a consistent direction. Early steel ploughs, like those for thousands of years prior, were walking ploughs, directed by the ploughman holding onto handles on either side of the plough. The steel ploughs were so much easier to draw through the soil that the constant adjustments of the blade to react to roots or clods was no longer necessary, as the plough could easily cut through them. Consequently, it was not long after that the first riding ploughs appeared. On these, wheels kept the plough at an adjustable level above the ground, while the ploughman sat on a seat; whereas, with earlier plows the plowman would have had to walk. Direction was now controlled mostly through the draught team, with levers allowing fine adjustments. This led very quickly to riding ploughs with multiple mouldboards, dramatically increasing ploughing performance. A single draught horse can normally pull a single-furrow plough in clean light soil, but in heavier soils two horses are needed, one walking on the land and one in the furrow. For ploughs with two or more furrows more than two horses are needed and, usually, one or more horses have to walk on the loose ploughed sod—and that makes hard going for them, and the horse treads the newly ploughed land down. It is usual to rest such horses every half-hour for about ten minutes. John Deere, a Vermont (U.S.A.) blacksmith, noted that the ploughing of many sticky, non-sandy soils might benefit from modifications in the design of the mouldboard and in the metals used. He noted that a polished needle would enter leather and fabric with greater ease, and a polished pitchfork required less effort as well. In the pursuit of a polished and thus slicker surface for a plough, he experimented with portions of saw blades and by 1837, he was making polished, cast steel ploughs. The energy effort required was lessened, which enabled the use of larger ploughs, making more effective use of horse power. A simpler system, developed later, uses a concave disc (or a pair of them) set at a large angle to the direction of progress, that uses the concave shape to hold the disc into the soil — unless something hard strikes the circumference of the disk, causing it to roll up and over the obstruction. As the arrangement is dragged forward, the sharp edge of the disc cuts the soil, and the concave surface of the rotating disc lifts and throws the soil to the side. It doesn't make as good a job as the mouldboard plough (but this is not considered a disadvantage, because it helps fight wind erosion), but it does lift and break up the soil (see disc harrow). 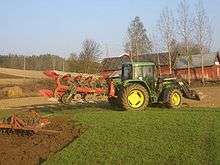 Modern ploughs are usually multiple reversible ploughs, mounted on a tractor via a three-point linkage. These commonly have between two and as many as seven mouldboards — and semi-mounted ploughs (the lifting of which is supplemented by a wheel about halfway along their length) can have as many as eighteen mouldboards. The hydraulic system of the tractor is used to lift and reverse the implement, as well as to adjust furrow width and depth. The ploughman still has to set the draughting linkage from the tractor so that the plough is carried at the proper angle in the soil. This angle and depth can be controlled automatically by modern tractors. As a complement to the rear plough a two or three mouldboards-plough can be mounted on the front of the tractor if it is equipped with front three-point linkage. The chisel plough is a common tool to get deep tillage (prepared land) with limited soil disruption. The main function of this plough is to loosen and aerate the soils while leaving crop residue at the top of the soil. This plough can be used to reduce the effects of compaction and to help break up ploughpan and hardpan. Unlike many other ploughs the chisel will not invert or turn the soil. This characteristic has made it a useful addition to no-till and low-till farming practices that attempt to maximise the erosion-prevention benefits of keeping organic matter and farming residues present on the soil surface through the year. Because of these attributes, the use of a chisel plough is considered by some to be more sustainable than other types of plough, such as the mouldboard plough. The chisel plough is typically set to run up to a depth of eight to twelve inches (200 to 300 mm). However some models may run much deeper. Each of the individual ploughs, or shanks, are typically set from nine inches (229 mm) to twelve inches (305 mm) apart. Such a plough can encounter significant soil drag, consequently a tractor of sufficient power and good traction is required. When planning to plough with a chisel plough it is important to bear in mind that 10 to 20 horsepower (7.5 to 15 kW) per shank will be required, depending on depth. The mole plough or subsoiler allows underdrainage to be installed without trenches, or it breaks up deep impermeable soil layers that impede drainage. It is a very deep plough, with a torpedo-shaped or wedge-shaped tip, and a narrow blade connecting this to the body. When dragged through the ground, it leaves a channel deep under the ground, and this acts as a drain. Modern mole ploughs may also bury a flexible perforated plastic drain pipe as they go, making a more permanent drain — or they may be used to lay pipes for water supply or other purposes. Similar machines, so called pipe-and-cable-laying ploughs, are even used under the sea, for the laying of cables, as well as preparing the earth for side-scan sonar in a process used in oil exploration. The paraplough or paraplow is a tool for loosening compacted soil layers 12 to 16 inches deep and still maintain high surface residue levels. The spade plough is designed to cut the soil and turn it on its side, minimizing the damage to the earthworms, soil microorganism, and fungi. This helps maximize the sustainability and long term fertility of the soils. Mouldboard ploughing, in cold and temperate climates, no deeper than 20 cm, aerates the soil by loosening it. It incorporates crop residues, solid manures, limestone and commercial fertilizers along with oxygen. By doing so, it reduces nitrogen losses by denitrification, accelerates mineralization and increases short-term nitrogen availability for transformation of organic matter into humus. It erases wheel tracks and ruts caused by harvesting equipment. It controls many perennial weeds and pushes back the growth of other weeds until the following spring. It accelerates soil warming and water evaporation in spring because of the lesser quantity of residues on the soil surface. It facilitates seeding with a lighter seeder. It controls many enemies of crops (slugs, crane flies, seedcorn maggots-bean seed flies, borers). It increases the number of "soil-eating" earthworms (endogea) but is detrimental to vertical-dwelling earthworms (anecic). Ploughing leaves very little crop residue on the surface, which otherwise could reduce both wind and water erosion. Over-ploughing can lead to the formation of hardpan. Typically farmers break up hardpan up with a subsoiler, which acts as a long, sharp knife to slice through the hardened layer of soil deep below the surface. Soil erosion due to improper land and plough utilization is possible. Contour ploughing mitigates soil erosion by ploughing across a slope, along elevation lines. Alternatives to ploughing, such as the no till method, have the potential to actually build soil levels and humus. These may be suitable to smaller, more intensively cultivated plots, and to farming on poor, shallow or degraded soils that ploughing would further degrade. ↑ Lynn White, Jr., Medieval Technology and Social Change (Oxford: University Press, 1962), p. 42. ↑ White, K. D. (1984): Greek and Roman Technology, London: Thames and Hudson, p. 59. 1 2 Robert Greenberger, The Technology of Ancient China (New York: Rosen Publishing Group, Inc., 2006), pp. 11–12. ↑ Hill and Kucharski 1990. ↑ Paul Hughes (3 March 2011). "Castlepollard venue to host Westmeath ploughing finals". Westmeath Examiner. Retrieved June 1, 2011. ↑ Patrick Freyne (September 27, 2009). "The plough and the stars". Sunday Tribune. Dublin. Retrieved June 1, 2011. ↑ "The Famine Potato". St Mary's Famine History Museum. Retrieved June 1, 2011. ↑ Jonathan Bell, "Wooden Ploughs From the Mountains of Mourne, Ireland", Tools & Tillage (1980) 4#1. pp. 46–56; Mervyn Watson, "Common Irish Plough Types and Tillage Techniques", Tools & Tillage (1985) 5#2. pp. 85–98. ↑ "The Rotherham Plough". rotherhamweb.co.uk. ↑ Wilson, Rick (2015). Scots Who Made America. Birlinn. ISBN 9780857908827. Retrieved 5 April 2015. ↑ "Tillage Equipment" (PDF). Natural Resources Conservation Service. Retrieved 11 June 2012.